A family has a fun-filled reunion at one of America's most premier amusement parks. This is going to be a family reunion to remember. 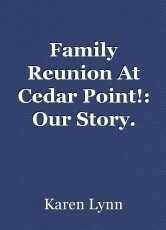 As I write this, we are on the road, headed for one of America's biggest (and best) theme parks this side of the Mississippi River; we're going to go to Cedar Point Amusement Park in Sandusky, Ohio, which is where we decided to hold our family reunion. We figured we needed some fun after the last few years; the last few years have been less than kind to our family, but we are determined to give the children (and relatives) some fun while we still can. The weather is picture postcard-perfect: low humidity levels, wall-to-wall sunshine, and temperatures in the middle 70's: you cannot ask for better weather. We are all excited; we hear there's over a dozen roller coasters and other rides, "from the wild to the mild", with all ages in mind, from the very young to the very old (or the young at heart). And we hear the food is out of this world; Cedar Point boasts some of the best food that can be found anywhere. Now we are on the Cedar Point Causeway, headed to the park. We can see the tall space needle and some roller coasters; from the size of some of them, they look quite gigantic. Anything to whet the kids' appetites; our older kids are pointing and laughing excitedly, as they map out their plans to ride the rides and make a day of it. Well, that's all in good; I just hope they include some of their younger siblings or cousins in on the action; I don't need any disappointed kids to ruin our fun! Soon, park guides are telling us to park; we do as they say; soon we disembark our vehicles, and we are headed for the gate, where we will meet up with some relations, and then we'll enter the park together after we get the tickets and get some maps, so we can figure out what's what and where we are going before we meet more relatives at the lunch court. The air smells wonderful and a nice breeze is blowing off of the pristine waters of Lake Erie (or is it Sandusky Bay?? Can't figure which one is which! LOL They look alike to me!). When we meet up with some relations, we exchange kisses and hugs; any animocities we may have had in the past immediately dissolve, and we are determined to make it a fun experience for all involved. But it breaks my heart to see that one of my nephews is now sitting in a wheelchair; he has muscular dystrophy and it has worsened; but even he can't stop smiling: his face is wreathed in a huge grin as he looks at the rides, and he is determined to get in at least one good ride in. He wants to ride one of the roller coasters. I just hope that he will be able to do so. If not, he is going to be so disappointed, and we can't afford that right now. We want him to have fun, just like any other kid his age. Soon, we are in line of our first ride. The SkyHawk, which is a huge swing like thing. It goes very high; but the happy screams from the riders tell our ears that they are enjoying themselves (but am sure there are a few who aren't enjoying it!). We have a little while to wait; so we pass the time by talking and catching up on the latest news. It is good to hear that most are doing well, and we tell them what we have been going through, such as my being laid off three months back (but my wife has been able to suppliment the family income by working two jobs), and also our youngest being bitten by chiggers and that his legs are a veritable forest of tiny red spots that itch like crazy. He stands in line and works at his legs, to try to stop the itching; we tell him to stop it before he makes them bleed or before he gets an infection. Mental note: make sure we get some calomine lotion from the first aid station later, so we can doctor Merritt's legs and hopefully stop the itching (at least for a little while). Now we're on the SkyHawk. The bars are lowered, and soon, we start off. Gently at first, swiging back and forth, but going higher and higher with each pass. Soon we are over 100 feet in the air as we race towards the sky, the wind rushing past our ears, and then headed back towards the ground, then going back up in the opposite direction, the ground directly below us. It is all terribly exciting, and the kids (and my wife) all scream with joy; me, it just makes me want to get off; I don't do big, swinging rides very well; the sensation makes me a bit woozy-headed. I just pray I can get through this ride without a.) losing my breakfast we'd had at McDonald's on the way here, or b.) getting dizzy enough to pass out. All too soon (and much to our relief), the ride is through. We are soon getting off, and I am relieved that I made it through the ride without getting sick or light-headed, though my tummy feels like it has a group of angry butterflies dancing the tango. I give my wife and family a shaky grin as we meet up and exit the gate towards the next ride. So far, so good. Let's pray this time together continues without incident. All I know is this: we are going to have fun, and I will make darn sure that we do!! © Copyright 2019 Karen Lynn. All rights reserved. Man, I miss Cedar Point. A lot of great memories from that place! They come vividly to mind reading these lines. Well done, Karen! This page was created in 13.8254 seconds.